Oxygen / Nitrogen Gas Plant. 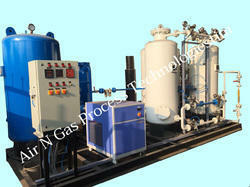 Industrial Gas Plant: O2 produced can be used in Industrial/Medical Application. Production: 200 Cylinders per Day of 6 M3 each cylinder. Power Consumption: 1.3 Kw per M3 of gas produced. Plant Capacity: 1 - 1000 NM³/Hr. Atmospheric air contains 78 % of nitrogen & 21% of oxygen. 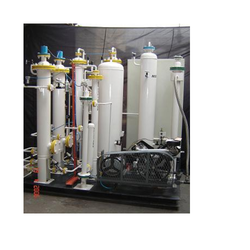 Oxygen in PSA (Pressure Swing Adsorption) Method is generated by Physical separation of Nitrogen from atmospheric air and outlet the Oxygen is collected for use.